killer custume jordans theres nothing wrong with them the just dont fit there a size78 holy crap i know your probaly thinking i was drunk when i bot them my uncles a big foot he said the were just a little to smal. 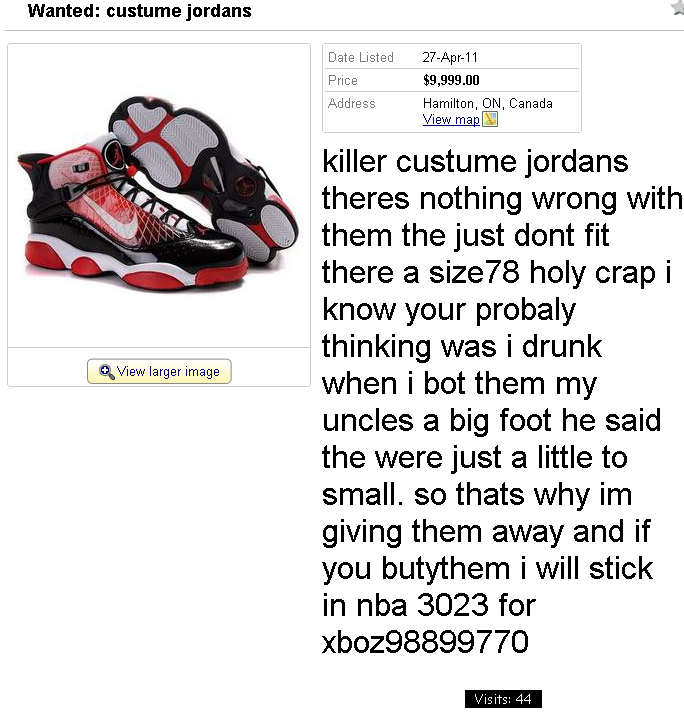 so thats why im giving them away and if you butythem i will stick in nba 3023 for xboz98899770. Every Kijiji ad is special -- but not every Kijiji ad is written by someone who's be considered "special" in the sense of "your boy is not going to graduate this year because he keeps eating the crayons, and when he counts to ten, he gets lost at 'orange', so we think he may benefit from being in the special class." This is among the worst Kijiji ads I've seen in terms of basic writing. But he has a picture, so I can't fail him. Besides, we don't fail students any more.